Art appreciation has always been a favorite topic for us here on Saffron Tree. For this new year, I am delighted to share with you all a cluster post on some of the books we have enjoyed reviewing on Warli Artform. Over the years, we've read a number of folk art oriented picture books from India, along with a few western art oriented books. Books incorporating folk art are always a hit in the homefront as they offer culturally enriching visuals that are meaningful. Warli holds a special place among all. That's because the simplicity of the artform lends itself easily to different age-groups making it universally accessible. At the storytime program last month here at a local children's activity center, I was thrilled to create Wonderfully Warli as a new theme for children in the 4-8 year age-group. After a brief introduction to the simple ways of drawing Warli figures, I read to the small group that had gathered for my session, two of my favorite Warli picture books. Both by Tulika books. 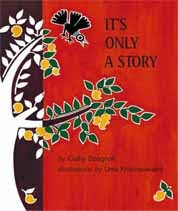 One titled It's Only a Story by Cathy Spagnoli. Warli illustrations by Uma Krishnaswamy. The book has been reviewed here by Tharini on Saffron Tree. "An ant’s curiosity leads to adventure in this chain story of repetition and cumulative images. 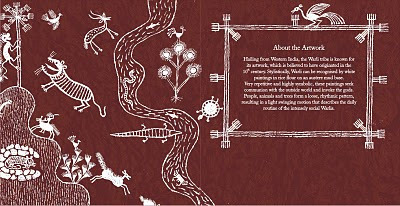 The illustrations within illustrations drawn in stark white on brown are adapted from the art of the Warli storytellers. Chain stories are fascinatingly illustrated in a flowing river-like fashion, capturing the pattern of the cumulative tale visually as well." The artform is so popular in modern India that it is not a coincidence that many more Warli stories have been done by other Indian publishers working for children. It's therefore a pleasure to present here a list of what seem like equally entertaining books on Warli by other Indian publishers that I simply can't wait to lay my hands on. 2) Tara Books - Do! Finally here's something for teachers, storytellers and parents - an entire Warli lesson plan created by our very own UTBTkids for CROCUS 2010! Overall, I found the books that I read offered a very enriching experience for children. The children also worked together in creating a simple Warli puppet for themselves as an extension activity. I am sure there might be many other choices on Warli based books that I may have missed. If you happen to know of other Warli titles, please do drop us a note on ST. Thanks! It is good that you have posted book names for children. Today children read so less. The reading habit in children is something every parent should cultivate. Thanks for the great list. Wow! Would love to try them! Praba, would love to bring the kids if similar programs come up.. Is that only for the children from a particular activity centre? hi Vidya - at a center here in Palavakkam and it was actually open to all. Hippo is hosting one for their members and that's tomorrow. I am going to singing/reading Penguin stories. Will keep you posted. Will put up updates on littleowlstorytime.blogspot.com. Since A was gifted a Warli kit 2 years ago, she has been fascinated by the art form. She had a school project last year where she had to make a presentation on Maharashtra- she has gleefully made chart borders with Warli art! On Mumbai trips, one can see a lot of it on billboards, etc. A wonderful compilation, Prabha! There's another book, also by Pratham books and by Benita Sen-"It's fair to share"
Thanks for the compilation, Praba! We really enjoyed Dancing on Walls, It's Only a Story and Do! - reaching for them from our bookshelf when inspiration hits.